Explore Halong Bay on Oriental Sails – one cruise vessel featuring 18 deluxe cabins and one featuring 8 deluxe cabins furnished in classic Vietnamese style. This cruise into the legendary Bai Tu Long Bay includes various activities that will indeed provide a truly unique experience. It’s all terrific! 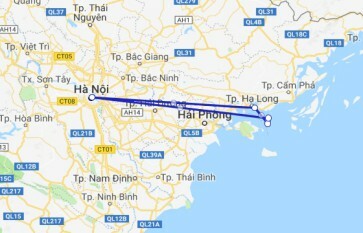 08:00 – 08:30 Optional pick-up at hotel and start the 3 hour-and-a-half drive to Hong Gai Tourist Wharf, check in Oriental Sails JSC’s private waiting hall - The OS Lounge. My girlfriend and I booked a trip to visit Halong bay with Oriental sails. We booked online after looking at the pictures of the boat, rooms and looked at ratings Our initial concern was the room on board the boat would not be as expected, however we were plesantly surprised. Although not large, there was enough space to be comfortable and unpack for the night. There was also a private ensuite bathroom. The best part, however, was the large bedroom window that delivered some fantastic views of the scenery. Another highlight was the food which was delicious and plentiful. Also our guide, Tom, was great and very knowledgeable. We have got nice travel. It was amazing and beautiful, our guide was very friendly and careful. I travel with my dauther, and on the our ship we were met with other couples from New Zelland and Germany. Total 6 people on board. It was cool and comfortable, cabines were clean and food tasty and good decorated. We hope see Tu again, and wish lucky the crew in their difficult work! I would highly recommend Oriental Sails if you’re looking to do a Halong Bay boat trip. Professional, organised, a lovely boat and we were very well looked after. The food was great and plentiful! I’m vegetarian and they looked after me very well. The cooking class was fun too, I’m going to try to make those veggie spring rolls as soon as I get home! My only suggestion would be that the tour companies stagger the times that they visit the caves (all boats go at the same time) as it was just way too crowded. Halong Bay is stunning, one of our world’s wonders. Very peaceful. We are greatful to have this tour. Our guide, Tham, if I dont mispelled, is very helpful, generous and kind for us. She always gave a hand when we needed her. The cruise and all crew services will be the unforgettable moment for us. My wife and I took Oriental Sail 3 cruise to Halong Bay on two-day-one-night package. Our English speaking tour guide, Tham, is very helpful and professional. I must commend the guide and crew for their great service. The guestroom is great and we enjoyed the great meals provided by the cruise. Definitely will come back again.